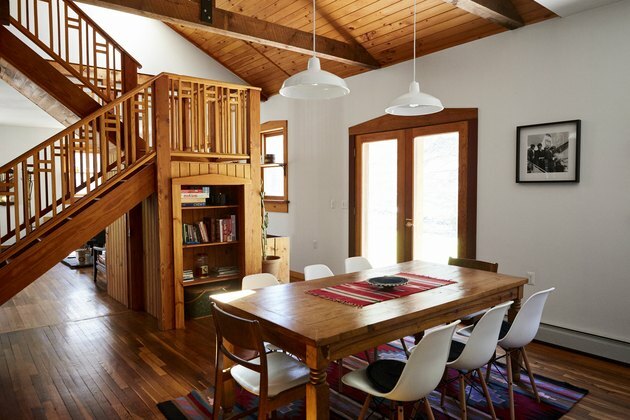 Nestled in the Catskills, a little over two hours away from New York City, you'll find the hamlet of Shandaken. For years, the mountainous area has been known as a spiritual retreat — in the '70s, Jimi Hendrix and Janis Joplin used to come for a sweat lodge; and in nearby Tremper, NY, the Zen Mountain Monastery has been offering Buddhist retreats since the '80s. The Flatrock House comes out of a slightly different history: In the '60s and '70s, the cabin served as a local bar, disco, and casino. 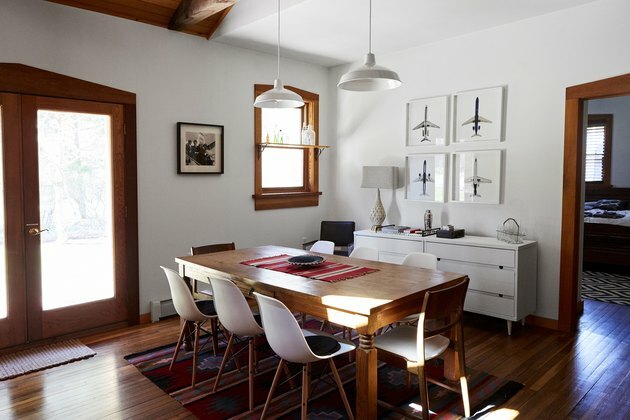 Now, it's a popular Airbnb three Brooklynite friends converted into a retro, rustic paradise. 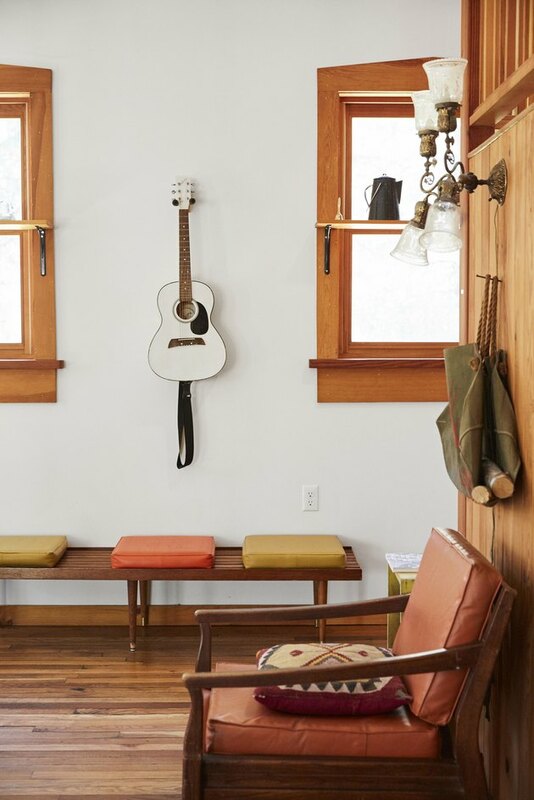 Situated on an idyllic creek, the four-bedroom home blends its original architectural details with curated midcentury finds to create a space that has just the right amount of kitsch. The sprawling open floor plan gives the house an open and airy feeling, while a working wood-burning stove makes things cozy after a long day of skiing. The owners didn't actually make too many changes to the house, which was built in 1951 and had served as a bar in the '60s. 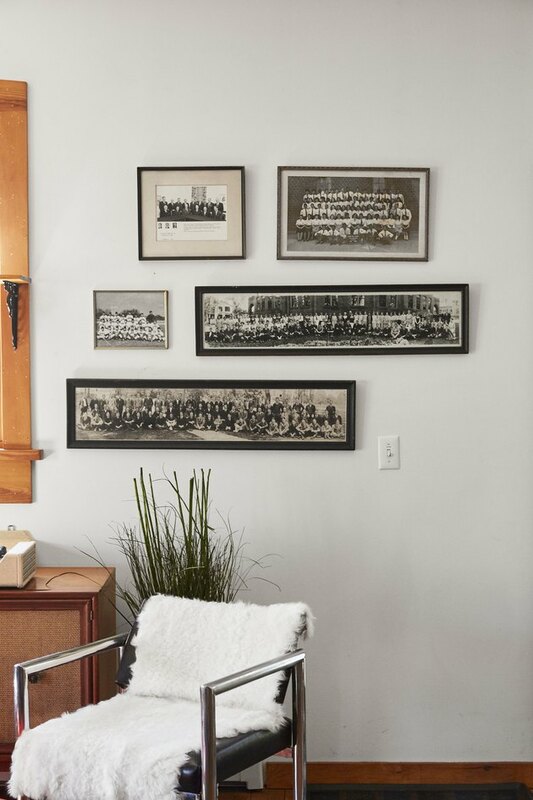 They added a fresh coat of paint and worked in their style with the original woodwork details. 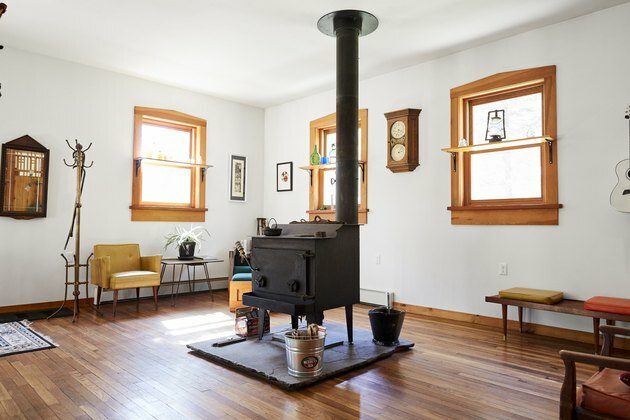 The owners went for a "modern bohemian cabin feel," incorporating farm antiques, textiles and souvenirs from personal travels, and midcentury furniture. 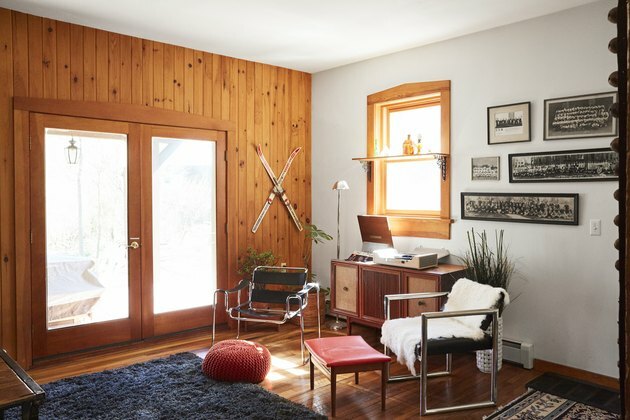 Almost everything in the cabin is vintage, purchased either in Brooklyn or in the local area. 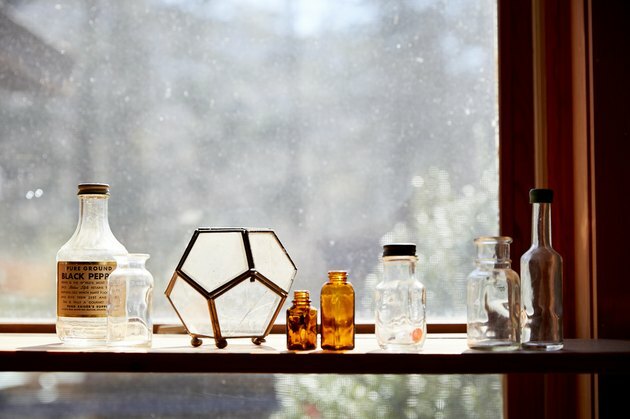 Inside, you'll find a thoughtful collection of vintage trinkets like this display of bottles. The light-filled living room offers a great spot to read or listen to records. 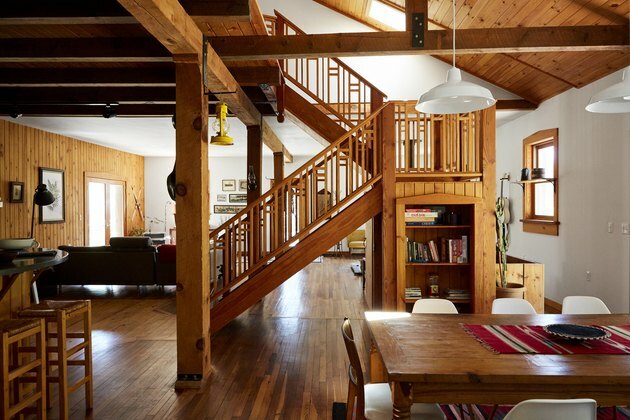 The Flatrock House attracts visitors year-round: People come in the winter for skiing at Belleayre Mountain, in the fall for foliage and hiking, and in the warmer months for fishing and swimming in the property's own private swimming hole. 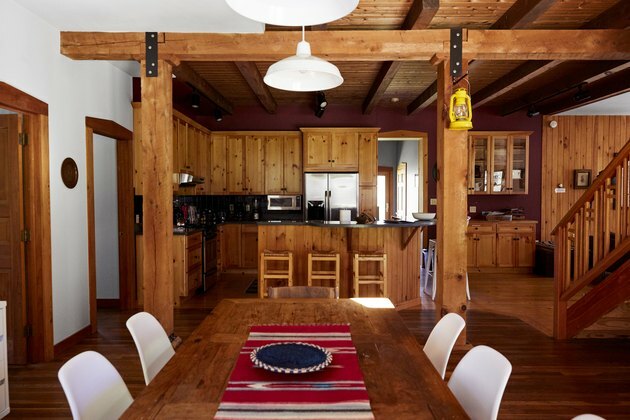 Midcentury furniture mixes with details that channel a rustic camp vibe.